“The Hound of Baskervilles: A Sherlock Holmes Play by Simon Corble. The Hound of Baskervilles doesn’t easily lend itself to the theatre, but dramatists seem unable to resist the challenge. I’ve not had the chance to see it performed, but Simon Corble’s play is pretty close to the top of my list of favourites. It was written to be performed out of doors, with the audience following the actors from place to place. Mr Corble boldly adapts the story rather than simply dramatising, and the result is clever, witty, exciting – and refreshingly intelligent. 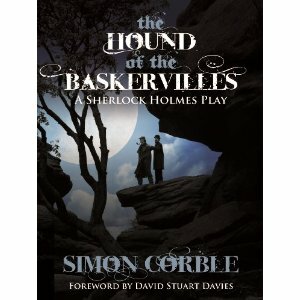 David Stuart Davies contributes an appreciative foreword, and the text is enhanced by a dozen photographs and superb atmospheric cover, using photos taken during a production at Brimham Rocks in North Yorkshire.” Hound of The Baskervilles: A Sherlock Holmes Play is available from all good bookstores including in the USA Amazon and Barnes and Noble, in the UK Waterstones, Amazon and Book Depository (free worldwide delivery).